Moses obeyed God and did as He commanded. The twelve spies who were sent out by Moses to spy out the land of Canaan are Shammua, Shaphat, Caleb, Igal, Hoshea, Palti, Gaddiel, Gaddi, Ammiel, Sethur, Nabbi and Geuel. At the time when the spies went into Canaan, it was grape season. The 12 spies went as far as the Wilderness of Zin and Rehob. It was there that they saw the three giant descendants of the Anak, who were Ahimai, Sheshai, and Talmai. Then they came to the valley of Eshcol and found many vine plants there. It was the grape season so the vine plants were heavy with cluster of grapes on them. The 12 spies cut down one of the branches of the vine plant that is full of grape fruits. The branch of grapes is so heavy that they have to carry it on a pole. And so the place is called Eshcol because the 12 spies cut down the branch with one cluster of grapes at that place. They also plucked some pomegranates and figs and took along with them back to their camp in Paran. After forty days, the twelve spies finished spying on the land and returned to Moses. 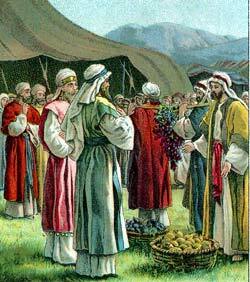 When the 12 spies returned to Paran, they showed the people the fruits. When the Israelites heard the report of the 12 spies, they grew afraid and dare not go up to Canaan. Only Joshua and Caleb believe that God will help them to defeat and conquer the Canaanites. The Lord was very angry that the people did not want to listen to Him. Moses cried out to the Lord and begged God to forgive the Israelites. God listened to Moses’ prayer and spare the lives of the Israelites but He promised that the people above twenty years of age will never be able to enter Canaan. The eleven spies whom Moses sent out brought bad report, so the Lord afflicted them with a plague and they died before Him. But Joshua and Caleb remained alive.